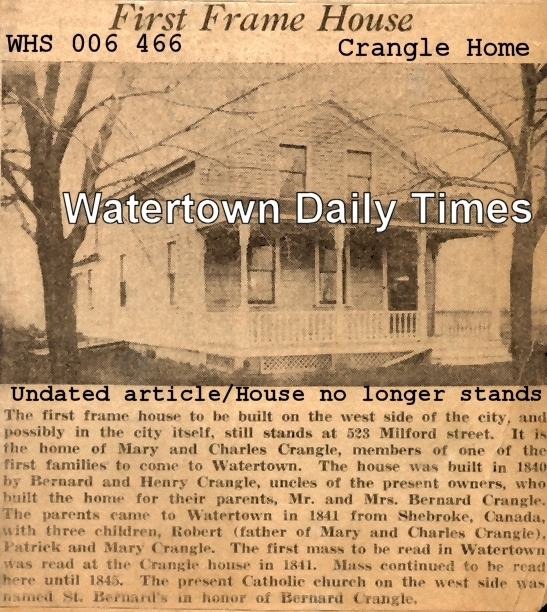 Bernard Crangle and family arrived in Watertown July 27, 1841. The Crangle family had come from Ireland in 1831 and had made their home in Sherbrooke, Canada, until coming to Watertown. Two sons, Bernard, Jr., and Henry had come from Beloit in 1840 and they built the first frame house in the village as well as a barn, both located south of the present east-west railroad tracks on the east side of the present-day Milford Street, directly opposite the Karma manufacturing plant. It was only a short walk to the cabin of Timothy Johnson. The land was purchased from John Cole on May 30, 1840, and consisted of 68.05 acres. The next summer, Bernard Crangle, Sr. together with his wife Mary, and sons Robert and Patrick arrived in Watertown and took up residence in the home their carpenter sons had built for them. That house was of very sturdy construction; typical was that the oak roof boards were all one inch thick and twenty inches wide. The house, located at 523 Milford Street, is as originally built, except for the addition of plumbing, new floors, a porch and some new ceilings. It has been occupied throughout the century by members of the Crangle family and, in 1941, was the home of Charles and Mary Crangle, grandchildren of Bernard Crangle, Sr. Both gravel and sand pits were developed on portions of the property. When the gravel pit was created, thirty human skeletons were found in it. The sand pits also contained dozens of skulls as well as other human bones, including those of children. The Rogan farm was located on land that had been an Indian burial ground. While Indian artifacts were not unearthed, dozens of stone arrowheads turned up in the fields. At the time the Crangle family settled in Watertown, the nearest Catholic church was located in Milwaukee. Members of the family went to that church on occasion, presumably when they made the lengthy trip to Milwaukee to replenish provisions. It was in these early years, very likely in the fall of 1842, that Fr. Kundig came to Watertown. The Crangle boys had gone to Milwaukee for supplies, met Kundig there, and brought him home with them. From that time forward, generally every other Sunday, he regularly stopped at the Crangle home and said Mass there, using a small cherry table as an altar. That table has survived and is used in St. Bernard's Church even today where it holds the altar breads, water and wine used by the priest in the celebration of Mass. The house stood over 100 years and no doubt can last another hundred years, for a barn frame cut from the forest supports the strong timbers. The first Mass said in Watertown was celebrated in the Crangle home by Father Kundig in the fall of 1841, and he continued to visit the village at intervals until 1845 when the first little church was completed on the site of the present St. Bernard’s. On a Saturday afternoon of a cold winter day in the month of December, 1841, in making the circuit of his mission on his way home to Milwaukee, the Rev. Martin Kundig made his second visit to Watertown, stopping at Bernard Crangle's home, now the residence of Robert Crangle, and announcing his purpose to celebrate Mass on the morrow, and requested one of the boys to notify Catholics living in the vicinity. Henry Crangle carried the message to Daniel Crowley and William Barrett's family and to James and Patrick Rogan who then comprised the Catholics residing in Watertown. Accordingly, on that Sunday morning Father Kundig found kneeling before his improvised altar, Bernard Crangle and wife, four sons and one daughter, Daniel Crowley, William Barrett, James and Patrick Rogan, all told. Mass over, Father Kundig made a short address urging upon his hearers the necessity of providing a place suitable for divine worship, and requested those present to meet him there in the afternoon to initiate some plan for the erection of a church. In the name of God, here we will build our church and here and now I will name the congregation, and the church when erected, and as a compliment to our good and venerable friend Bernard Crangle will call it St. Bernard, and by that name it will henceforth be known. From 1840 [sic] till 1844 Father Kundig and his successor on the mission Father Morrissey, in their periodic visits to Watertown always found a cordial welcome at the house of the Crangle family, and in the little twelve-foot square room [?] and good fathers were wont to celebrate Holy Mass at each recurring visit. CROSS REFERENCE: Three years later, in 1898, while excavating in Crangle's field south of the Chicago, Milwaukee & St. Paul railway track, workmen unearthed the skeletons of two persons. One was supposed to be the remains of an Indian and a portion of a gun was found near the bones. The other remains appear to have been a child. Indications pointed to the fact that at an early day the place was used as a burying ground, but since the city was first settled no records show that white people found a resting place there. The place of the find is on the banks of Rock River, about eighty rods south of the railroad bridge [WR]. In 1941 thirty human skeletons were found when a sand pit was developed in the area [WDT]. Crangle property site of Van Camp. Charles Crangle, 24-year-old son of Robert Crangle, accidentally shot himself in the left side. The Annual Charter Election of 1859; one of the polls was at the house of Robert Crangle. Miss Mary Crangle, 86, of 301 South Montgomery Street, retired Watertown school teacher and for many years principal of Lincoln School, died at 8:10 a.m. today in St. Mary’s Hospital following an illness of two weeks. 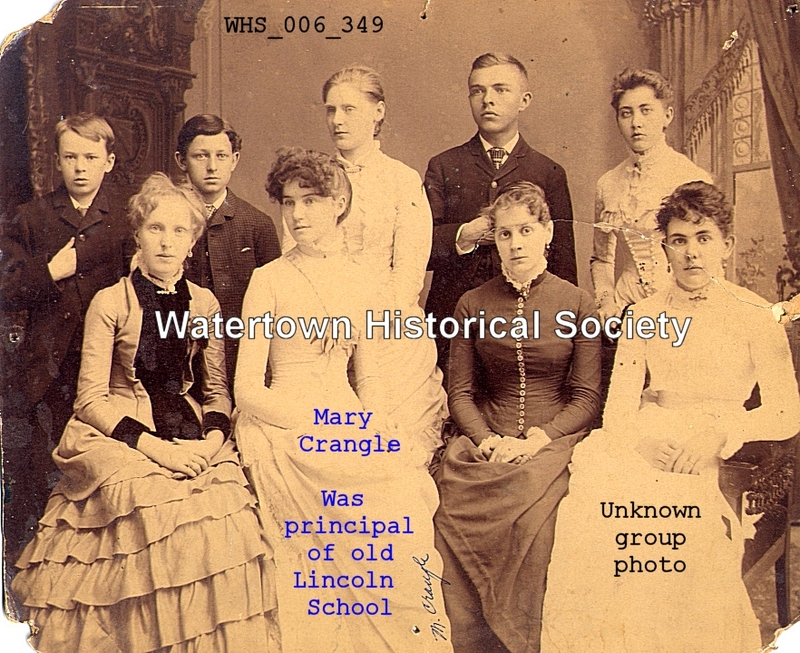 Miss Crangle was a native of Watertown and was born Feb. 23, 1867, a daughter of Mr. and Mrs. Robert Crangle, who were among the pioneers of Watertown. She attended St. Bernard’s School, Watertown High School and the University of Wisconsin. She taught here for 47 years.